All week, I’ve been trying to research U.S. census data for one of our upcoming articles. Turns out, today is the government shutdown which means everything except for “vital services” and the related employees are closed. The idea is that anything which, by being open, requires the government to spend money that Congress has not approved cannot open. I understand that. That’s why the parks, monuments, research projects, etc. are are closed. They have not been given permission to spend money. However, you’d think that, like the Zoo continuing to feed their animals, the government could continue to pay for their website hosting. And the government continued to pay for their website hosting and the domain name licensing but hid all of the data from Internet users. Why does that make any sense? Why did http://www.census.gov/ close? 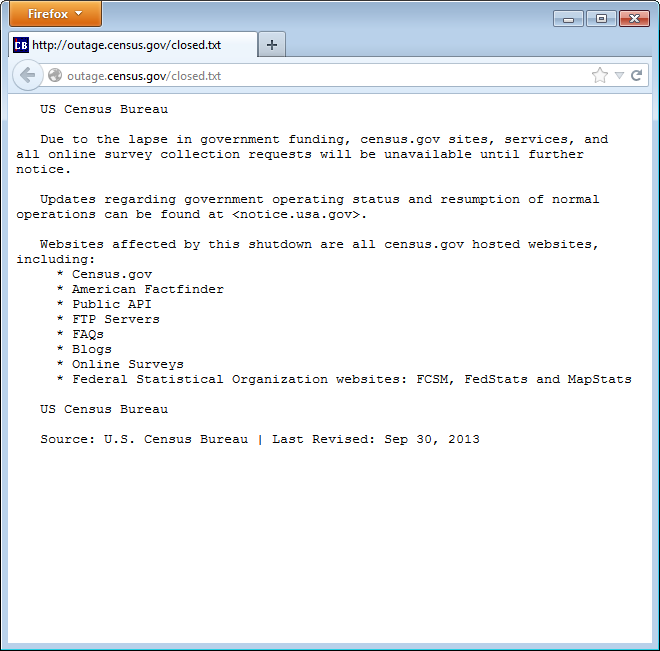 In order to display the above TXT file, Census.gov had to pay for 1) hosting, 2) the domain name, and 3) some employee to put up this file. If they had instead just left the website alone, displaying its normal census data, it would have only cost them 1) hosting and 2) the domain name. Like the Zoo animals costing the government food and feeder salaries rather than food, feeder, vender, and janitorial salaries, it would have been cheaper to leave the website up but send the employees home. Clearly our administration wants to make a point though. By cutting everyone off from anything government related, they show us addicts how much we need them, what withdrawal could be like without them. 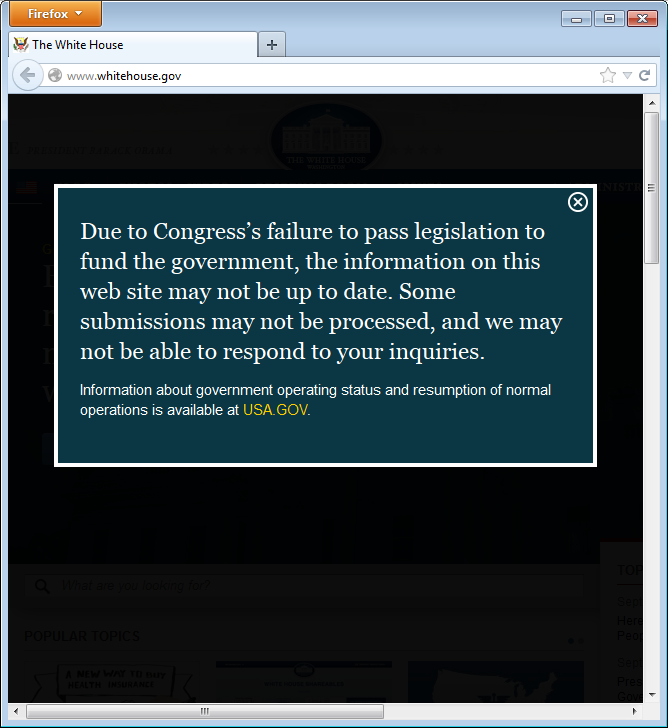 I was surprised when, shortly after 11am, they updated WhiteHouse.gov to take you to a modified homepage, rather than the above outage screen. I wonder what lucky executive employee got to perform that job and whether he or she was paid for it. His article came out at 2:10pm and, like my experience with WhiteHouse.gov suggests, the list of websites either up or down seems to have changed since he posted his article. Still that these sites were ever down, seems interesting. 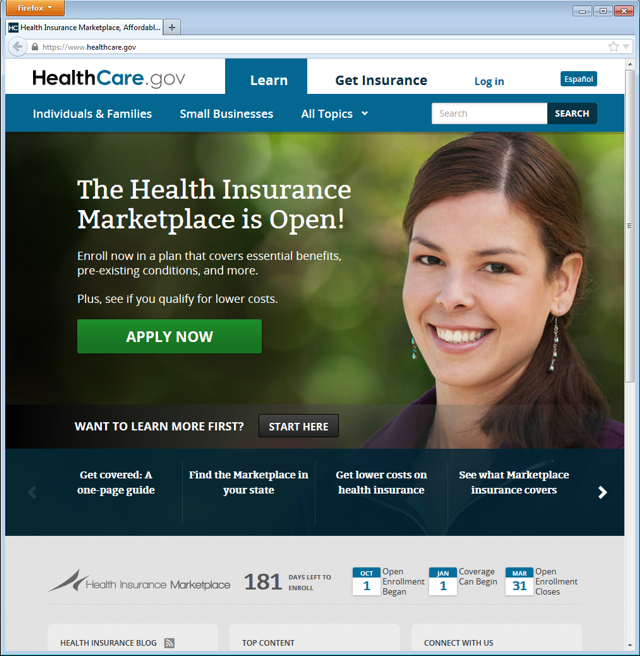 Given that websites represent the front-end of numerous back-end processing systems, agencies must determine whether the entire website can be shut down or components of the website will be shut down.